As a runner in my fifties, who hopes to carry on running into old age, what can I learn from women who have continued to run through their fifties, and into their sixties and seventies? There are very few women over 64 running in the UK. According to the latest Sport England Active People Survey (APS9) 0.14% of women over 64 run once a week or more. Applying this percentage to the UK population data gives a figure of just under 8,800 women aged 65 and over who run regularly. This small group of older women runners is challenging what is expected of women of their age, challenging the stereotypes of frailty and physical decline. They are easily overlooked: not all of them are running races, and those who do may finish near the back of the field. I believe they have valuable stories to tell us about overcoming difficulties, finding inner motivation, and achieving something remarkable. I want to celebrate their achievements and share their voices through this blog. I was delighted when Sandy (Sandra) Poole agreed to be the first interviewee for my blog. I’ve known Sandy for five years. When I joined Holme Pierrepont Running Club she was the Ladies’ Captain. 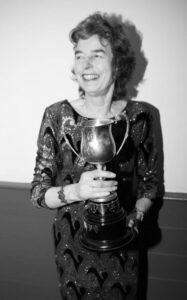 In 2014 Sandy became the first woman in our club to compete in the V70 age category. I was curious to find out when Sandy had started running; what opportunities she had had to run as a child; and how she views her running now. Sandy is very modest about her achievements, so I did a bit of research and have included some of her recent achievements at the end of the article. I interviewed Sandy on 22nd January 2016 at her home in Nottingham. I went out training, I did one mile and that was fine, I did three miles and that was fine. But I didn’t have a training programme. Derek was racing and I’d do the fun run and he’d do the big run. And my training was really that. It wasn’t until sometime later that I trained on a regular basis. John Denver was coming over to England in 1986 and he was running in a race round Holme Pierrepont and seeing that I adored his singing I thought, “I’ll run in that.” So that was my first 10k and my first race. Then I did a half marathon at the end of that year. Did you do sport at school? I went to a French school in London and sport was not on the agenda, unless you went voluntarily on a Wednesday afternoon, which was a half day, and it was two buses to get there. I didn’t go, but I always ran in the playground, played football and cricket, and that sort of thing. I used to love running: playing cops and robbers; and we were running more or less the whole play time. So when you were at school there wasn’t any idea of running a race? Oh no, I think I would have loved to do it but I didn’t know how to really. I knew there was an athletics club nearby, and I just wish I had been a bit more persistent, because I think actually I was better suited to the track than to the road. But I don’t think I made my wishes known to my parents sufficiently. I think really you didn’t know how to go about joining (a club) when you were young. But we did always go for country walks every week, at a good pace, so we were fit. My mother would never take a bus, we always walked. I used to grizzle and hate her for it but I’m grateful to her now. I did do a lot of cycling. I used to cycle to school. My parents were very liberal. When I was 13 I went on a cycling trip for a week (organized by “Girl” magazine). We cycled the North Yorkshire Moors and coast. I went on my own. I was put on a train to York. My grandmother met me at York and that was where it started from. I think my mother was very brave letting me go. She let me cycle all over London. I went off when I first had my bike to visit my aunt who lived about 12 miles away, right through heavy traffic. So she said, “If you can do that, you might as well (cycle)”. I’d have been terrified to let my children do that. And then when I was older, but still a teenager, I went to visit my grandmother, who lived 200 miles away. I cycled in sections. I think I did it in 4 days. I did that on my own. Did the bike give you a lot of freedom? Oh yes. That made me strong for running. As I said when I took up running it was no problem to progress one mile, three miles, six miles, and then to do a half marathon. It wasn’t because I was good or anything. I wasn’t very fast, but it was just that, thanks to my mother, I’d developed the fitness as a teenager. How did things progress after your first year of running? What encouraged you to carry on? First of all, it was something that Derek and I did together. We’ve got separate interests, but running was something that we agreed that we were going to do together. We went to races, but I certainly didn’t do a lot of races to start with. Probably about 10 a year, and then 20 a year, and I can’t remember exactly when that changed. Eventually we were doing about 50 races a year on a regular basis. I did do a bit of training then, but I didn’t like it. I like to race. I like to have a purpose to my running. It might be delivering letters or something like that, and I enjoy it; but just going out and running 10 miles for the sake of it (is less appealing). I would train on my own and Derek would train on his own. We’d go to races and start on the start line together, then he would go off. But I was slowly catching him up with my times. Then he started training more seriously, and he got really quite fast. When did you run your first marathon? My first marathon started because I was doing a half marathon. At the Robin Hood in 1993 I set off to do the half marathon, and went on and did the full marathon. I did say to the family, “If I feel good I’ll do another lap.” No training above 13 miles until then. I got up to 17 quite easily, and then I ran and jogged. In those days you didn’t have to go through the finish. The finish was off to the left, and if you were doing the marathon you just went straight on. So you could just go and do the second lap. Were there many women running in that race? There were a lot of women. I think numbers have increased but there were quite a few women. I can’t remember when women were first allowed to run a marathon but I know that it was thought beyond their capabilities. Did your motivation come from racing? Yes, I wanted to be best in my age group, and sometimes I succeeded and other times, I didn’t but that was my main aim and to get my times down. I’ve always been competitive. When I first started I was right at the back, and I used to say to Derek, “I hope I’m not actually last”. I have been last, but gradually I moved up until I was doing a lot better. So you were quite determined, you weren’t discouraged? No I’ve always been self-motivated. I always think I can do it even if I don’t come anywhere near the front. I always think…even if it’s an impossibility…I always think that I can do it. The fact that Derek was running meant you could support each other and you had someone who understood why it was important. What other things would you say supported you to carry on running? I don’t think anyone else encouraged me. It was all self-motivation. Really I like running on my own so I can go at my own pace. Were there any things that you feel got in the way of running or made it difficult? I think I might have started running sooner if I hadn’t had a family. But I wouldn’t have swapped having a family. But once I started to run I just kept going. I don’t think there was anything really stopped me doing it. Were you doing other sports as well? I cycled and I swam, but I don’t think I particularly enjoyed swimming. I was invited to train to be a swimming teacher when my children were having lessons, and I taught swimming and lifesaving courses on a voluntary basis for over 35 years. I loved it really. When I was 60 I did a triathlon. That seems like a natural progression, doesn’t it? I loved it. But I only did the Long Eaton one. I think I did it for five years, but the dates started to clash with other things. So triathlon wasn’t quite your thing? I did like triathlon, but it does take up a lot of time and you have to travel to various places. And I think when you get to 60/65 your cycling awareness isn’t as good as it should be. You lose your nerve; your balance isn’t quite as good. You can’t twist your neck round enough to see. I wouldn’t have wanted to take it seriously. Perhaps when I was 30 years younger that would have been great. What contributed to your 50s being your best period? My 50s were my best running years. I was training for my first London Marathon and I started putting in serious training. If people looked at my running log they’d think how did I get by with that little training. Some people say you should train miles and miles and miles; but I had other interests. I didn’t train as much as a lot of people do. My highest mileage week was 55 miles. I don’t think I ever attained that again. My average was 30 miles a week. I think that was quite sufficient for me. Probably no more than ten to a dozen. I don’t know how many times I ran London, at least five. I’ve done at least five marathons abroad, including New York, Leiden and Padua. I think there was one year when I did several marathons. When I was running a lot I think my average mileage was about 25 miles a week over the years. Don’t ask me what it is now! It must be down to about two miles. Have there been health issues or injuries that have stopped you running in the past? When I was 59 I got a virus in the November and it was really quite bad. I got back to running in the February. I went out (to do marathon training), came back and was totally exhausted. I thought, “Well, you get exhausted training for a marathon,” but what I hadn’t realized was it was the start of post-viral fatigue which lasted a year. I did run during that year but there were lots of times when I couldn’t run with tiredness and joint pains. It was a bit of a nuisance because it was just before my 60th birthday: the year you’re going to set the world alight with new times; and I was running well. At 58 I had a personal best time running round the lake at Holme Pierrepont. I do feel a bit upset that my times at 60 weren’t as brilliant as they could have been, but it’s just circumstances. I bounced back at 61, but you do start deteriorating. At 68 I was diagnosed with bronchiectasis (a long-term lung condition) and asthma. I hadn’t had asthma before that. There has been a really marked deterioration. People say it’s your age but I know it’s not just that because other runners in my age group are still going strong. On short runs it’s not so bad and if it’s track I’m still okay. I’m just pleased I’m running. I enjoy the parkruns. The glory days are over, such as they were. There are many people much better than me. I’ve never been top notch. I’ve never claimed to be. What have been the highlights of your running career? 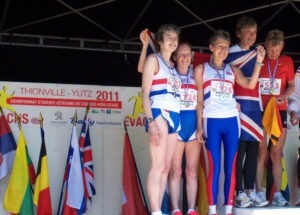 I think the highlight were the European Veterans Athletics Championships (road races) in Aarhus in Denmark in 2009. I was with my rival and we were really pleased because it was the first year of being 65 for both of us. We got a V65 Gold team medal (for the 10k) and a Silver as well (for the Half Marathon). Have you been to a lot of veterans’ track events? I’d have liked to compete at 3,000m at a European one but it’s the dates. Things have clashed. I just feel my 3k track has been a bit jinxed. I went to Sheffield one year on a really snowy icy day and when we got there they said that our race was finished. They had changed the time and I was so cross, and so disappointed. And on another occasion I went to France or Belgium and a week before I got a cold and couldn’t run competitively. I went for 400m and found I was quite competitive in that, although not as competitive as my 3k times. Are opportunities on the track sometimes limited? There are events in London, but it’s always a problem getting there. I do the County events, but then I’m the only one in my age group running amongst (younger) vet ladies, and the nearest in age to me might be about 50. They could solve it a bit by just putting us with the (older) men. Other times I’ve done 3000m it’s been with young girls. They’re so supportive, they come afterwards and say well done, but I’m about 2 or 3 laps behind. One thing that’s really irritating, and that they ought to do something about, is that once the first runner finishes they stop the clock. So you’ve got no idea as you run round the last few laps on your own what time you’re doing. They stop shouting it out. It shouldn’t be (like that) because when you do Europeans they keep the clock running and they shout your times. There’s no excuse not to. I had Derek shouting out the times once I found this out. Because you really need that, you don’t want to be peering at a watch, particularly when you’re running and don’t have your glasses. My best time in 3000m was when John Oldfield (another club member) paced me and I shall always be grateful for that, because I had someone to run with. That was really good, because it’s so difficult on your own. For example, how far should you actually push yourself in 400m round a track? And until you’ve got other people doing it you’re not going to know what you can and cannot do. I don’t know how they can solve that problem really. You’re a pioneer in our club as well because you were the first woman to compete at 70. In my sixties I often raced against Pat Allen (who competed for another Nottinghamshire running club) who was about my standard. Sometimes she’d win, sometimes I’d win. And when I did my first 3k we were both running together. I knew Pat was just on my shoulder which was great because she was pushing me and I was pushing her. And it just so happened I just beat her, but she doesn’t run now. When did you join Holme Pierrepont Running Club? I joined in 1988. Derek joined a bit later. I found it very unwelcoming at the start, but over time I found it to be supportive. It’s a very welcoming club now. What did you get out of being part of the running club? The running weekends and weeks that we do together. The camaraderie from that. Inter-club events. There have been lots of things we’ve done together. I’m very grateful to Holme Pierrepont. They’ve done a lot for me. Which year did you become Ladies Captain? I did it for 12 years from 2002. Was it important to you to encourage other women? Oh yes. I wanted to encourage them to do what I know they’re capable of doing. That was the most important part of being Ladies Captain. Can you see the potential in other people quite easily? I don’t know about that. I can tell whether they should be running faster. My other bugbear is people not starting on the start line! If you’re likely to win the race or gets lots of points (for the club), go to the front. To join a club, you’ve got to be a team player. I didn’t mind how slow people were if they were fulfilling their potential. You don’t fulfil your potential if you’re at the back chatting. If you’re a captain you have to accept that not everybody is competitive. What are your aspirations for this year and beyond? I had a bad year with my health last year (2015) and I had two falls when running. This year I’m going to do well. This year I’m going to train hard. How did those falls affect you? Were you injured? The fall where I knocked myself out has affected me. That was in June. It wasn’t serious really, it just really dented my confidence about running downhill. I’ve really got to get my head round running downhill now and I think with a year of running I should do it. I’ve been doing flat races and I’ve been doing flat training. This year is going to be a year without excuses. What are your targets for racing? I’d like to do some more parkruns, and try and get my time improved on that. I could do a training run after a parkrun. I wouldn’t want to do a race after a parkrun, which is a big change as I was someone who would do two races in one day, and not blink an eyelid. But you’ve got to accept the changes that come as you get older. Not that I’m giving in to old age. I shall keep running until I really can’t. I won’t compete in races where I’m holding people up. I don’t mind coming last in a race where there are lots of people. I’d rather not come in last, and I do my utmost not to come in last, but once you start holding people up that’s it. That’s when you’ve got to give up, I don’t expect marshals to wait for me. What I do now is I try to always get a season’s best. I try and run well at the beginning of the season, and then try and beat those times, because I’m never going to do a PB now. You’re one of a really small group of women over 70 running, you’re paving the way for people like me and my sister who hope that we’ll still be able to keep running into our 70s. It’s so encouraging to see women turning out and doing races and still being competitive. I’m well aware that there are a lot of 70-year olds who are very good. There really are. And there are some that aren’t very good at all. So what? We mustn’t keep on measuring people’s achievements just by their time. It’s the fact that they are actually doing it. When I think of my friends with walking sticks and knee replacements I think I’m jolly lucky, I really do. In your 50s you’re young. Make the most of your 50s! You can still do PBs. I guarantee that, if you try. You can still do it. And if you get fed up with distance try track. You might find you’re a track runner. Don’t ever say you can’t do it because you haven’t trained. That is an excuse. Do what I do, always believe in yourself. Sandy was the fastest female V65 runner at the mile distance in the UK in 2012 and second fastest in 2015 as a V70 runner. From 2009 to 2015 she has placed in the top five for the 3000m in her age category four times: as V65 in 2009 and 2012, and as V70 in 2014 and 2015. 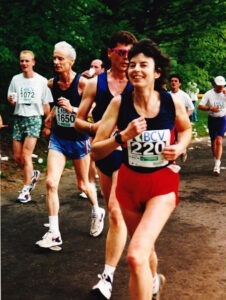 Her times at road races from 5 miles to half marathon have regularly placed her in the top ten in the UK in her age category since the age of 60. At the time of interview, she was the 17th fastest V70 woman at parkrun in the UK. Her parkrun times often have an age grade of over 80%. She has won many Gold county medals (awarded annually by Nottinghamshire Amateur Athletics Association for best age category performances at 5km, 10km, Half Marathon and Marathon distances). 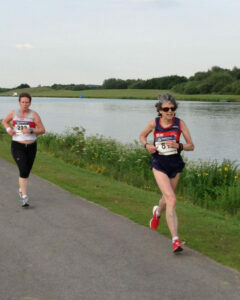 Sandy currently holds 40 club age group records, more than any other athlete in Holme Pierrepont Running Club. View Sandy’s profile and record of achievements since 2004 on the Power of 10 website. Credits: banner photograph – the line-up for the 10km race at the European Veterans Athletics Championships, Aarhus, Denmark, 2009 – by Kim Gudmand (permission applied for). Nice job with the interview! And what an inspiring subject!! Hope I can keep it up as I age. Thank you Rebecca. Me too! My next interview is with a runner in her 50s. Hi, I am a woman age 56, started running at 52 with several health issues. I hope to be running into my old age. I’m not competetive so will not join a club, prefer to run on my own. I am hoping to achieve 10k this year and run 5 miles a week. Its hard with working full time but you have to make the time.